This is my "updated" student display board for the new school year. 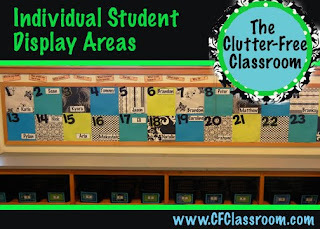 I wrote about the original version last summer and featured other ideas for displaying student work as part of my Setting Up the Classroom Series which featured photos, tips and ideas for setting up an elementary classroom. You can read about the other areas featured in that series here. This board worked so well for me that I decided not to change it up too much. Last year my color scheme was aqua and lime and this year I'm going with my Bright and Cheerful color scheme so I added a few bright colors into the board to reflect that. It was a VERY easy change. 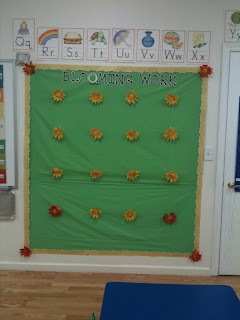 I also added a new cursive alphabet above the board. I loved that it was a perfect fit. 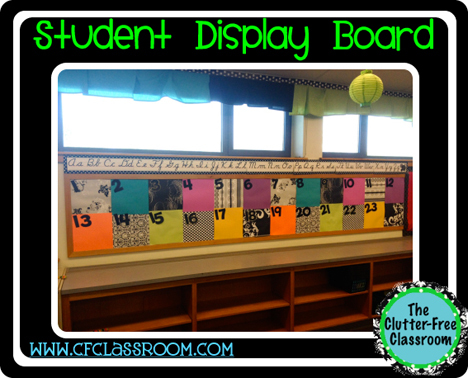 I use this board to display student work throughout the year, but at the start of the year I use it to help everyone learn the names and numbers of each student. Each square has a student number. I will soon add their names and a headshot photo of each of my new little friends. Just for reference, this was what the board looked like last year. I liked it just fine, but thought the additional color splash was a good touch for this year. I included a picture of my board when I wrote aboutStudent Work Display Boards during my Setting Up the Classroom Series. However, since I received some requests and questions about the board yesterday after posting my basket labels, I figured I would elaborate on it. 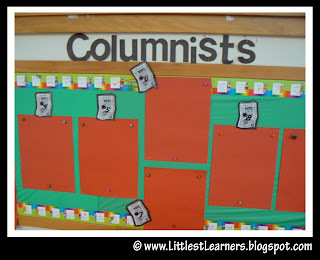 I have a narrow bulletin board along one wall in my classroom. I used solid color cardstock alternated with black and white patternedscrapbook paper to create a checkerboard effect. I ended up overlapping the papers instead of cutting them. Truth be told it was out of laziness as I didn't feel like cutting, but I do like the staggered look. Next, I attached a black number cutout that I bought in a package at Dollar Tree. 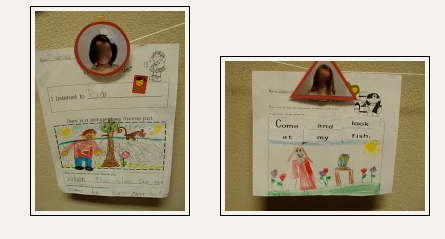 I printed my students names in text boxes with bold borders and stapled those on as well. That's about it. When school starts I plan to take a photo of each of my friends, print them in black and white and attach them to their square with photocorners. 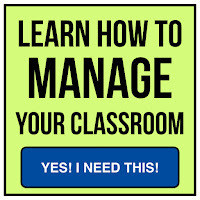 I assign a number to each student and we use those numbers to make things more efficient in class. I use the number to label supplies, pencils, etc. 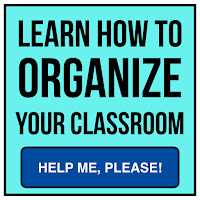 The students write their number in the top right hand corner of all assignments which makes alphabetizing them a quick and simple task that then saves me time recording grades and returning their work to their student mailboxes (since those are also in number order). 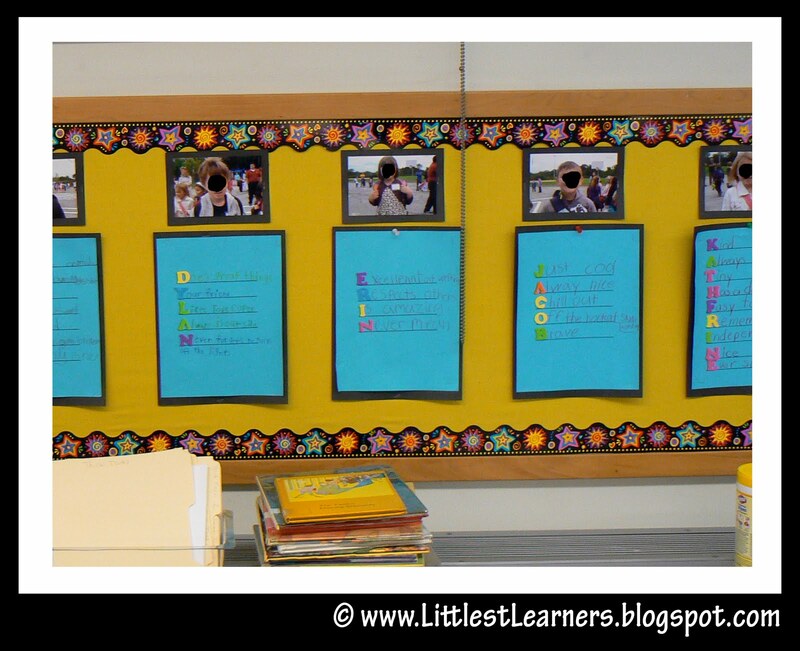 This board makes a great resource as we all learn each which number associates with which friend. 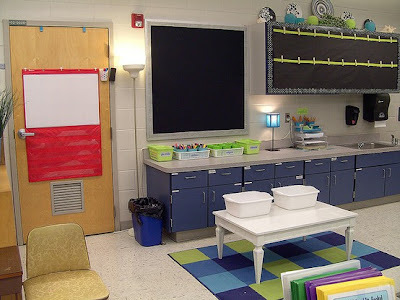 As the year progresses, I use the space to display student writing. I often make photocopies of their writing on a reduced size setting to fit the space. I once loved creating bulletin boards. And by loved I mean LOVED. I would plan them in my head and tweak them until the reality matched the vision. At the risk of being institutionalized, I will admit that I have used actual levels and tape measures to perfect them. Each was a work of art worthy of it’s own gallery premiere. People should have worn black dresses and tuxes as they sipped wine and stared in awe as they discussed the merits of my work. And then the desire slowly fizzled and the demands grew and time became limited and priorities changed and now bulletin boards have become something else on the to do list. Occasionally, the creative bug will bite and I’ll go all old school and whip up a masterpiece, but for the most part I try to keep it simple. 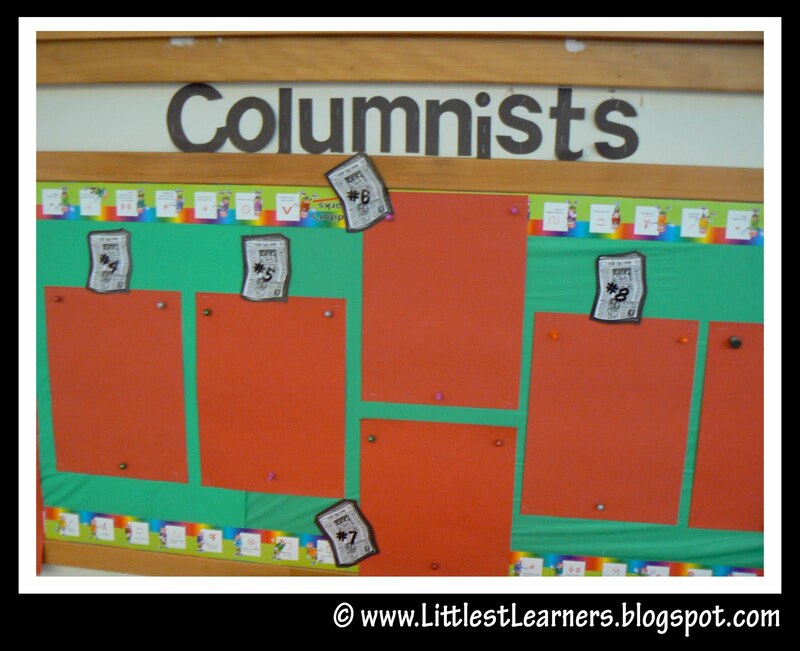 I have a lot of “interactive bulletin boards” in my classroom now. 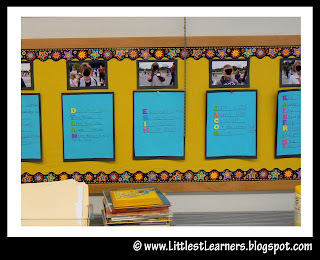 These are things like word walls, a weekly language arts focus wall and my CAFÉ board that are ongoing throughout the year. But, there are those boards that need to be changed regularly. 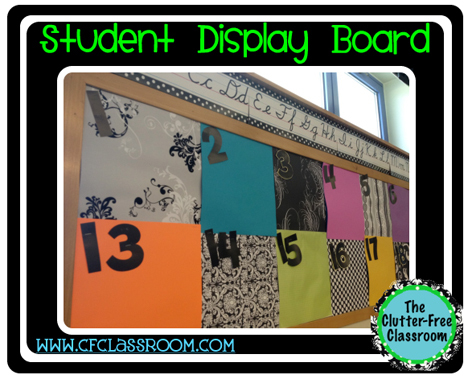 One simple way to do that is to create a board that is maintained by your students. Provide each student with a space on the wall that belongs to him. 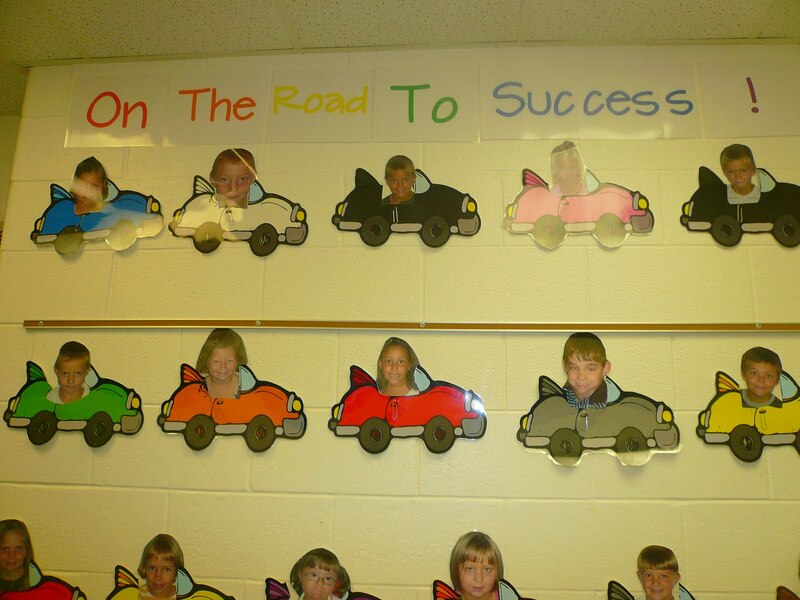 You could hang a background paper and label it with the child’s name. Let the student select what he wants to display and allow him to put up the work he wants to showcase in that spot. 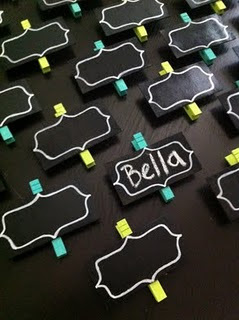 Slip a paperclip over the back of the construction paper background. The child can slip his work under the clip. Mount photo corners to the background paper. This looks very cool and artsy, but has some downfalls. The children are limited to the size of the work they can hang and some lack the fine motor skills to use the photo corners. 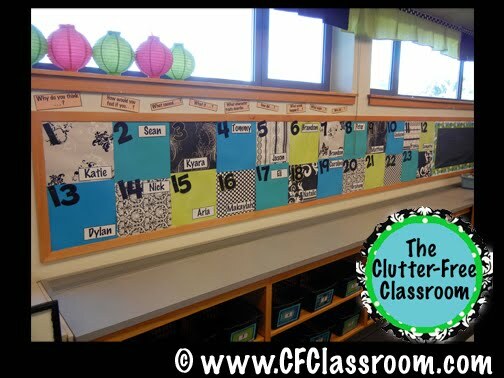 Tie a line of string, twine or fishing line and provide each student with a clothespin that has his name on it to hang the work with. 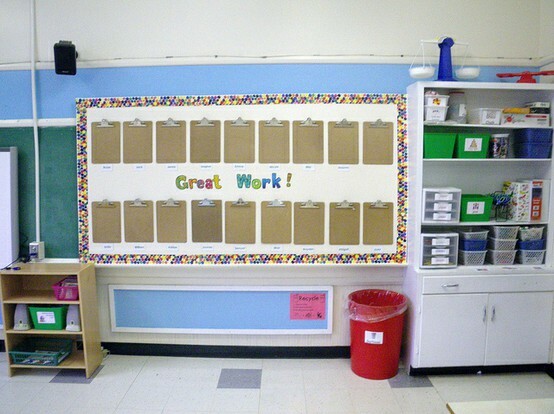 Staple a large Ziploc bag to the wall and let the students slip the work into the bag. I use my friends pictures in my classroom any chance I get. These clothespins are a great way to incorporate their smiling faces. 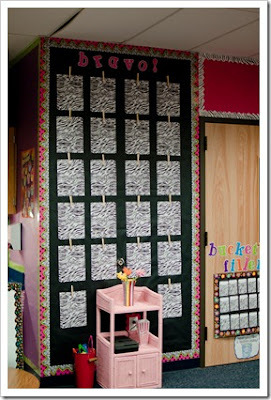 I especially like this idea for preK and K students since the name isn't always obvious on their work. My love affair with Eloise's classroom continues. Check out her bright clothesline. 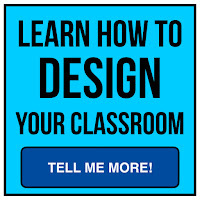 With the black background I would imagine the students' work will pop. Cara's board is neat and organized and oh-so-colorful.